CARFAX 1-Owner. REDUCED FROM $19,900! 3rd Row Seat, Rear Air, Onboard Communications System, iPod/MP3 Input, Back-Up Camera, TRANSMISSION, 6-SPEED AUTOMATIC, ENGINE, 3.6L SIDI V6, AUDIO SYSTEM, COLOR TOUCH AM/FM/SIRIU. LPO, INTERIOR PROTECTION PACKAGE includes (VAV) first and second row all-weather floor mats, LPO, (VKN) third row all-weather floor mats, LPO and (VLI) all-weather rear cargo mats, LPO. COLOR TOUCH AM/FM/SIRIUSXM RADIO WITH CD PLAYER 6.5 diagonal touch-screen display (STD), 3.6L SIDI V6 (281 hp [210 kW] @ 6300 rpm, 266 lb-ft of torque @ 3400 rpm [359.1 N-m]) (STD), 6-SPEED AUTOMATIC (STD). 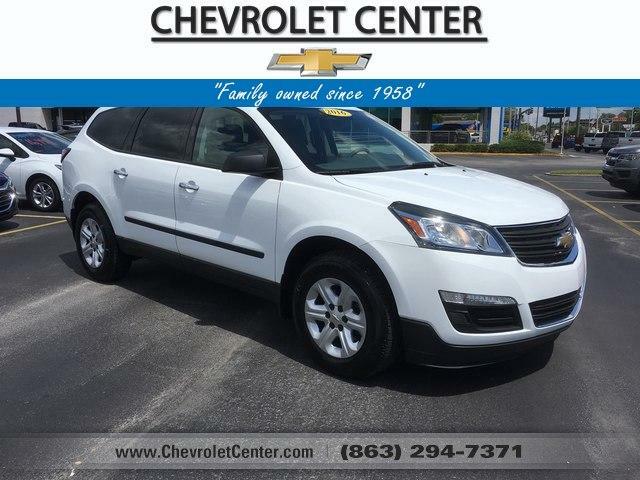 Edmunds.com's review says When it comes to cargo space, the Traverse is definitely a leader in its class. Even with the third-row seats in place, it can carry more luggage than most rivals..
Includes (VAV) first and second row all-weather floor mats, LPO, (VKN) third row all-weather floor mats, LPO and (VLI) all-weather rear cargo mats, LPO.